John Passant discusses the political and economic conditions underlying the rise of "Hansonism". PAULINE HANSON appealed to those fearful for their small businesses or their jobs by warning us from her pulpit in the House of Representatives that Australia was being in danger of being swamped by Asians, 20 years ago. This time, she ranted, we are in danger of being swamped by Muslims. All that has changed in 20 years is the identity of the alleged invaders. Her first speech last week as a Senator was full of incorrect statements and policy proposals that bear little relation to reality. We are being swamped by Muslims. Ban all Muslim immigration. Send those already here who did not "assimilate" back to where they came from. End halal certification because it is funded by a tax on food, a tax that funds terrorism. Ban any new mosques. Monitor those already built. Fathers are killing their kids? Abolish the Family Law Court. Single mums and Muslim fathers are having large numbers of kids to different partners and living on thousands of dollars of taxpayer money a week — stop their payments. She generalised this last bit to attacking all the disadvantaged. Hanson, however, was sweet reason itself compared to the other One Nation senator from Queensland, Malcolm Roberts' full tin foil hat. He called for an AusExit from the UN and muttered darkly about the climate change "conspiracy" and international bankers.The latter is often code for Jewish bankers. Roberts has form on this Jewish conspiracy rubbish. His document called ‘Why? Motives Driving Climate Fraud’ identifies international bankers as using climate change to further their goal of controlling the world. None of the political rants of Hanson or Roberts have much relationship to reality, but that is not the point. Hanson appeals not to facts but to emotions. Hanson has found a scapegoat that attracts some people, especially since 9/11 and the War on Terror, and all the state-driven rhetoric against Muslims associated with that. Muslims, or Indigenous Australians, or Asians, or single mums and Muslim fathers, or in the case of her Queensland lieutenant, the UN, or the CSIRO, or NASA, or Jewish bankers, or some bizarre mix of some or all of them, have become a target of collective anger. Where does that anger come from? In the words of Bill Clinton: ‘It’s the economy stupid.' Precarious employment, part time jobs replacing full time ones, unpaid overtime worth more than $110 billion and the end of the mining boom and its impact on the Western Australian and Queensland economies, in particular, have been major contributors. Interestingly, in South Australia the beneficiary of this uncertainty has been Nick Xenophon and his team with three senators and a lower house representative. His more mainstream protectionism and pork barrelling, without the racism, have undermined Labor who in practice have, together with the Liberals, overseen the destruction of the car industry in that state. Small businesses in rural and regional Australia, and in more affluent pockets of major cities, are threatened by change and decline when mining companies and other big businesses pull up stumps. More generally 33 years of neoliberalism and wealth shifting from labour to capital under successive Labor and Liberal governments have created a fear of the immediate and the future for many workers and small businesses. In Marxist Left Review, an analysis of the 1998 Queensland election, where One Nation won 11 of the 82 seats showed, to generalise, that support was most likely to be found in rural and regional electorates, where middle class occupations (such as real estate agents, petrol stations, newsagents, pharmacists and so on) predominated, where there were no big workplaces and workers were not unionised, or were unemployed. The massive decline in union membership and the increase in precarious employment since then, plus the end of the mining boom, may change that. Yet it still appears Hanson’s demographic support comes from rural and regional communities and she threatens not Labor just yet but the Nationals. This helps explain why Queensland National Party member, George Christensen, is close politically to One Nation. They are fighting for the same supporter base. In the Senate, One Nation won 593,000 votes (or 4.3%) nationally. One Nation now has four senators — two from Queensland, where Hanson’s organisation won over 250,000 votes (9.19%) of the vote. A politician like Hanson appeals particularly to those threatened by capitalist change with her targeting of false enemies. Those "enemies" are generally the most marginalised. In this targeting, Hanson merely reflects the wider ruling class approach. Australia was – and is – a colonial settler state. Our ruling elite have a long history of targeting minorities and others. The early settlers dehumanised Aboriginal people to steal their land and hence destroyed their lives. Like Hanson, those targets of the capitalist class have changed over time, from the Irish to Irish Catholics, from the Chinese to all non-whites, from Southern Europeans to Asians, from Muslims to refugees. There remains the eternal "other" for white settler society — Aboriginal people and Torres Strait Islanders. The racism and othering is top down, driven by the privileged class. Australia’s bipartisan government policy of locking up asylum seekers in gulags on Manus Island and Nauru is a classic case of othering, as is the Northern Territory Intervention and all that flows, and has flown, from that. Labor and Liberal governments have fertilised the ground for the flowering of the likes of Hanson. It looks as if the response of the current political establishment, like John Howard before them, is to embrace her. The relentless process of capitalist change and the uncertainty that this creates has not abated. The decline in the global economy continues apace. This will only make Hanson more attractive, especially now that she has a soap box from which to spout her views. 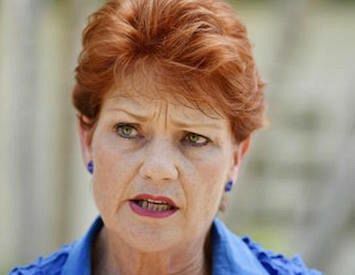 If the Australian economy worsens – and in light of the lack of a strong union and mainstream left wing response to economic uncertainty, and the racism of One Nation – Hanson’s appeal will only increase. How to respond? ALP Senator Penny Wong boycotted Hanson’s first speech. The Greens walked out on the One Nation Senator during her fact-free racist, xenophobic and Islamophobic rant. This sent a powerful message of support to Muslims across the country: You are not alone. It will not stop Hanson. We have to stop the conditions that make Hanson so attractive. We have to fight job losses, wage cuts, growing inequality and cuts to basic public services. The ALP left, far from opposing that agenda, have for been part of it for some time. The situation is urgent. We need to patiently explain why the capitalist system is the problem — not Muslims, or Asians, or Indigenous Australians or Jewish bankers. Most of all, we need to unite to fight the system and the symptoms it produces that give rise to Hansonism.